(The house, the garden and the swimming pool is just for your private use). you will not have to share with other guests! This very charming cottage is situated between Lucca and the sea, in the vicinity of silver shining olive groves and a small wood. Casa Mimi is an excellent choice for those who want to spend a romantic holiday in a tasteful and comfortable holiday home. The coast of the Versilia , the lovely nature and the art beauties of Tuscany are certainly a visit worth. Relax on the deckchairs at the wonderful swimming pool (set in earth, approx. 7 x 4 m, deep: 1.20m) – a completely fenced garden, which is equipped with a table, chairs, sun, umbrella and barbeque is at the guests’ full disposal as also the swimming pool. Entrance: living room with 1 double bed settee, TV, 3 steps to the kitchen, dining table, stove, oven, fridge/freezer, washing machine, 1 double bedroom, 1 bathroom with shower, WC, bidet. We specify that the owner lives in front of Casa Mimi, but they work all the Day and they don't stay often outdoor , because they don't have time. Further details outdoors: The property is superb for outdoor living as it enjoys sunshine from dawn to dusk. The gardens provide perfect areas for relaxation and for children to play. the garden with private swimming pool, sun loungers and covered Loggia with BBQ for Al Fresco dining. Swimming pool only available from April to October. Casa Mimi is situated at 500 mt about a village, called S.Martino in Freddana. In the village there are one shop for every genre as a supermarket, a pharmacy, some restaurants, some pizzeria. Delicatessen, Butcher Shop, Bakery, ice-cream shop, Coffee Shop, Tobacco Shop, Hair Salon, Mechanic, Dry cleaners, newsstand, Catholic Church. 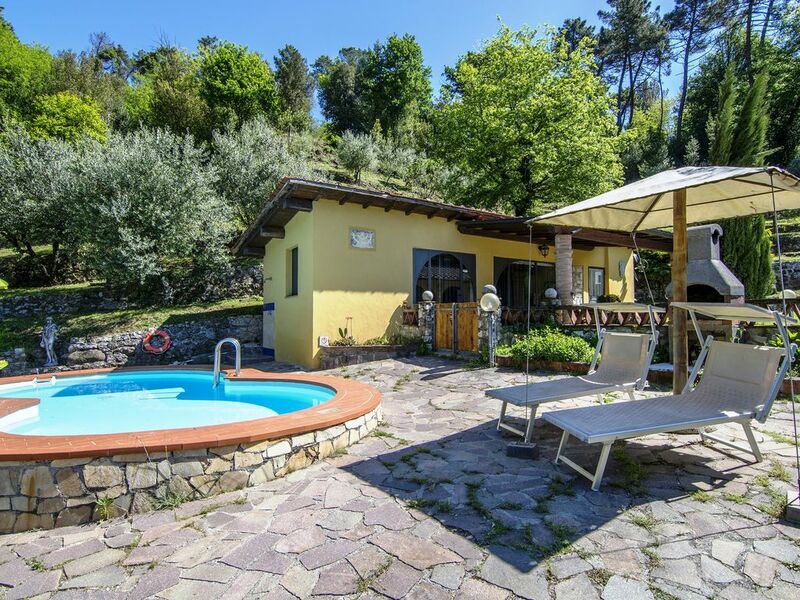 How to get there:: The villa is set in the countryside around Lucca, about 10 km far from the center of the town. Pisa airport is quite small and you pass through the formalities quickly. An alternative airport is Florence. 20minutes from Pisa, 45 minutes from Florence to reach the town. Direct flight from New york (JFK) to Pisa (PSA) operated by Delta Airlines. From Pisa Airport:- Take indications from Pisa Airport to Motorway (Autostrada A12) in direction of Genova. Take 1st exit on to Autostrada A11 towards Firenze(Florence) and take the first exit off this motorway for Lucca. Follow indications for city center (Centro) and you will see the walls of the city in front of you. Follow signs for Camaiore. Go along this road for 10 km and when you reach San Martino in Freddana turn right for Loppeglia/Fiano and after 200 meters, when the climb beginnings, take the first little street on right and continue for 200 meters until the house. This Holiday House belongs to my parents from 1990 .My father restored it few years ago, when I had a degree in literature and Languages in Pisa. It was my dream have contacts with foreign people and practice languages everyday. I ‘m so interested to other cultures and I like dealing with people from all over the world. I live quite next the house, this area means a lot for me, here are my origins. I was born here and grew here, I travelled a lot but this is my place, I know its products and the uses of my earth and with my job I’d like to express what really this earth is : its hills, perfumes, green, special food and traditions. One bathroom with shower and with a window with view on the swimming pool and a lumber-room (washing machine). full kitchen with a fridge/freezer, hob, oven and sink. The house, the garden and the swimming pool is just for your use. For your added comfort during the summer months mosquito nets are fitted to all windows. The owners have built a small golf court, about 600 m from Casa Mimi which extends on 4 hectares. There is a special price arrangement for guests. For what concern tasting wine, we are producer of white and red wine , in fact the vineyard are next to the house! The first bottle for our guest is a present. My husband and I spent our honeymoon at Casa Mimi and had a wonderful time. We hired a car and this made it easy to get out to different places. We did several trips into Lucca, but also did days out further afield to Florence, Monteriggioni, San Gimignano & Pistoia. We also spent several days lounging and in the pool or walking into the local village for Gelato & Pizza. There was ample space for 2 people and everything you would need for your stay. Mimicha met us on arrival and showed us around. Her parents were very welcoming, and her Dad even provided us with a bottle of wine one day, which was very kind, but they also respected our space and left us to it. I would highly recommend staying at Casa Mimi, in such a beautiful part of Italy. It was really a pleasure to have you here for your honeymoon!!! Thank you so much for your comments, really appreciated. You were perfect guests and you will be forever more than welcomed. Very friendly welcome from the whole family. The bungalow had everything we needed, with enough room for our daughter to stay with us for a few days. Weather was gorgeous, which made the pool very welcome. Very peacefull spot, the local town. Had a supermarket, bar gelateria and pizzeria, Lucca was 5 miles away, and Pisa about 20.....both well worth a visit. Overall a relaxing, stress free break. Ciao!! Thanks for your nice words. I'm happy that you found everything to you liking. It was great having you as my guest and hope that you visit our area again soon. Thanks for your review. It has been a pleasure help this people who were in difficulty at arrival , that s why one morning I woke up earlier to get them in Lucca with my car and my daughter of 2 years. I get them in Lucca to rent a car. When is possible we do all we can to help our guests. I was happy to do it for them. Looking at the picture of the bedroom nothing is hidden , dimensions are shown. Description too is clear and is explained where is situated the cottage. We have more than one cottage and this is the one we rent more, because is really appreciated!! Veel nice, well equiped appartement. The two of us stayed for a full week in casa Mimi. We were welcomed by Mimicha who is very friendly and helpful. The appartement is cosy, nicely decorated and very well equiped. We do a lot of home Cooking and found everything we needed. The service provided by the family who runs the rental was great. We had some issue with the warmwaterboiler and the boiler was replaced the same day. We prefer reading objective reviews when we select our holiday destination so here is why we deducted one star. The appartement is very close to ,at the back of the house of the owners, Mimicha's parents. Lovely and very sweet people who gave us our privacy and even some appatizers when they were having diner. Expect a few cars and a friendly wave a few times a Day. Reviewing beds is very personal. For us the matras was a bit soft and saggy with the springs noticable. We didn't sleep great so we would suggest upgrading the matras. You definately need a car to get around. All and all we were very pleased with the place and gladly recommend it. Thank you so much for your review. I m happy when people enjoy our efforts, We do all we can for our clients because our goal is a good souvenir of a nice staying in our property. You have well done writing about the mattress, nobody did it before. in fact I'll do a poll with next guests and if the most do not appreciate we will change it surely. Even if it will be difficult because in may someone told me was quite hard, so It’s a personal opinion, that s why I d like to have an average of opinions, and I’ll ask everybody just to a have an idea at the end of season and change it if necessary. I want to thank these guests that were very pleasant and nice! The pool was fantastic and just what was needed in the summer heat. The villa is well equipped and comfortable it is in a rural location but also within easy reach of many interesting places. We spent some time in Pisa on our way to the villa and then visited Cinque Terre (fantastic!!) San Gemignano, Lucca, Monte Carlo and its surrounding vineyards as well as testing a few of the many varieties of wine. We walked some of the many paths around the villa and made use of the excellent outside dining area where we had some very nice meals relaxing in the evenings and watching the shooting stars. Mimicha who met us at the villa at the start of our holiday was very helpful and easily contacted if we had any problems and the owner was also very friendly and told us some of the history of the villa and the surrounding area. We had a really lovely, relaxing weeks!! Thank you very much for the lovely review! It was a pleasure to host your family and it is a great encouragement to start the new year with their positive feedback. Our intent is to always do our best in welcoming travelers at casa Mimi hoping to leave a lasting and unforgettable memory. We had the perfect relaxing holiday ... the villa stayed cool all day which was lovely and had everything we needed. The aspect was simply beautiful. The welcome and hospitality was truly wonderful. Being woken by the sound of birds and watching the fireflies sparkle at night, a glimpse of a female deer at the edge of the forest .. stunning. Unspoilt Italy. Thank you for making this my best holiday ever. I really thank you for the nice word you say .It's really rewarding to work for guests so nice like you are. we put all the effort and passion in our work and It's nice to see the results of such dedication. We are happy when people is satisfied and spent a pleasant week!! we hope to see you again! Lucca with its monuments, squares, fountains, museums; with its tranquil medieval town center in great part pedestrian, with its theater, the Teatro del Giglio, and it's esteemed seasons of opera, prose, orchestral music and dance; with its important cultural events such as the Comics Revue and the Summer Festival, the traditional ones such as the procession of Santa Croce during the city's September festivities, or the Flower Market in April. Lucca is a city which offers the tourists attractions of historic interest and natural beauty with the sure knowledge that you can walk through the city and surrounding areas at any time in complete safety.